How to Draw Activity Diagram? Activity diagram is a kind of UML diagram that shows flow of control from activity to activity. It shows concurrency, branch, control flow and object flow. Furthermore, swimlane is used for partitioning actions based on the participants involved. 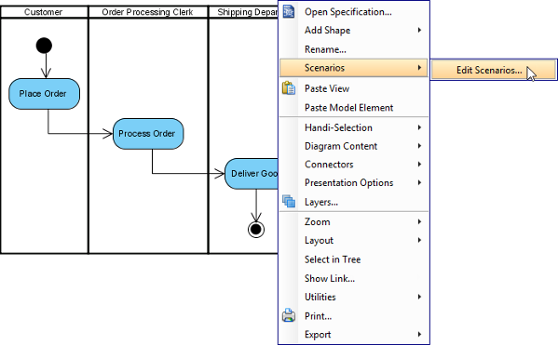 Perform the steps below to create a UML activity diagram in Visual Paradigm. In the New Diagram window, select Activity Diagram. You can click either Horizontal Swimlane or Vertical Swimlane on the diagram toolbar. Click on the diagram to create the swimlane. Double-click the partition name to rename it. To insert partition to swimlane, right-click on a partition and select either Insert Partition Before or Insert Partition After from the pop-up menu. Click Initial Node on the diagram toolbar. 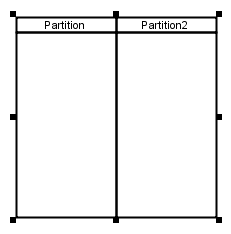 Click inside the partition to create the initial node there. Release the mouse button at the place where you want the action to be created. 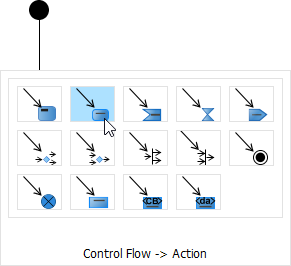 Select Control Flow -> Action from Resource Catalog. A new action will be created and is connected to the source shape with a control flow. Enter its name and press Enter to confirm editing. Right click on the activity diagram that contains the flows that you want to produce a scenario and select Scenarios > Edit Scenarios... from the popup menu. In the Edit Scenarios window, click Add... button at the bottom left corner. Select a path for generating scenario. Click OK to confirm. NOTE: A path is a continuous flow of actions in the diagram, with an initial node placed at the beginning of the actions. Multiple paths are obtained by determining the existence of decision nodes within the flow. Name the scenario. Add description if necessary. The actions being involved in the flow are listed in the Path table. 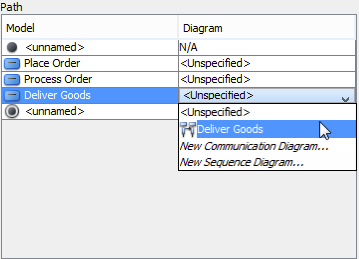 For actions that have sub-diagram(s), pick up the sub-diagram in Diagram column or just create a new one. You may, however, leave it unspecified which cause that action to be ignored when producing scenario. Click on the arrow beside the Generate button and select the type of diagram of the scenario. Whenever the sub-diagram(s) of action(s) are updated, you can update the scenario to make it represents the latest information of interaction. 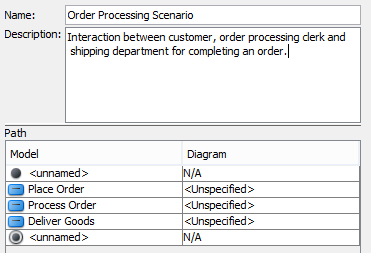 To update scenario, right click on the activity diagram that have scenario produced before, select Scenarios, then the name of scenario from the popup menu.